Witnessed Collapse: Follow the CPR steps for adults and adolescents. Check Pulse: Check the pulse by placing two fingers on the carotid artery (press your index and 3rd finger on the side of the neck against the windpipe). You can also check the wrist by placing the same two fingers on the inside of the wrist below the thumb. Make sure the child is resting upon a firm, solid surface. Before you begin compressions, determine if one hand could be used instead of two. One hand should be used for smaller children for safety reasons. Perform on the lower half of the breastbone (sternum). Do not lean on the child’s chest in between compressions and make sure the chest ultimately recoils. 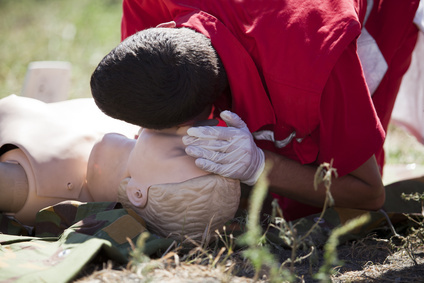 Limit all interruptions to less than 10 seconds while performing CPR. It’s important to note: When performing chest compressions on a child you should compress about 2 inches (5 cm) (at least one third AP diameter of the chest). Do not exceed 1/2 the depth of the child’s circumference. It should be between a depth of 1/3 and 1/2. Make sure your hands are placed correctly upon the child’s chest. Follow the same steps when performing CPR on an adult and adolescents: 30 compressions and two breaths equaling a ratio of 30:2. Two Rescuers: Perform tasks simultaneously. Administer compressions over breathing 15:2. Airway: Kneel beside the child the same way you would kneel beside an adult. Perform the three steps as you would with an adult. Tilt the chin and open the mouth while listening and feeling for any breathing for less than 10 seconds. Make sure nothing is blocking the airway. Proceed to the breathing technique if the child isn't showing signs of life. Breathing: Make sure to perform the same breathing task upon the child as you would upon the adults and adolescents. Children’s lungs are much smaller than adults, so make sure to give a lesser breath when performing this task upon a child. After tilting the head and chin, squeeze the nose shut. Seal your mouth over the child’s mouth and perform the breathing task. Remember, give one breath into the child’s lungs while making sure the child’s chest inflates. If the child’s chest doesn't rise, repeat the airway technique. After the chest inflates, perform compressions. Unwitnessed collapse Give 2 minutes of CPR. Activate the emergency response system. Get an AED and return to the victim. 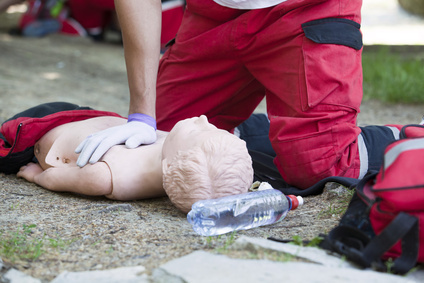 Resume CPR and use the AED as soon as it is available.